One astronaut is about to bravely go where no man has gone before: for a 26-mile (42 kilometer) run aboard the International Space Station. 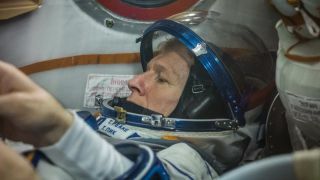 Tim Peake, a British astronaut with the European Space Agency, announced plans to run the London Marathon while he is on the space station in April of next year in order to raise awareness of The Prince's Trust — a nonprofit in London that aims to help people 13 to 30 get jobs, education and training. As other marathoners run through the streets of London, Peake will race along with them on a treadmill circling Earth at 17,900 miles per hour (28,800 km/h), ESA officials said on Peake's mission blog. In order to complete the race, Peake will have to strap himself to the treadmill using elastic straps slung over both shoulders, similar to suspenders. The straps will keep him in place as he runs, while an iPad screen will let him see himself running through the streets of London as if he were home. Peake ran in the London Marathon just once before, in 1999, and finished in 3:18.50. In order to stay healthy and in good shape to return to Earth, he won't be trying to beat that time. The hardest part, Peake anticipates, is running for long periods of time with those straps holding him down. "[The harness] has to provide quite a bit of downforce to get my body onto the treadmill, so after about 40 minutes, that gets very uncomfortable," he said on the ESA blog. "I don’t think I’ll be setting any personal bests. I've set myself a goal of anywhere between 3:30 to 4 hours." Although Peake is the first man to run a race in space, this isn’t the first time a space explorer has completed a marathon; NASA astronaut Sunita Williams ran the Boston Marathon while she was aboard the space station in 2007. Peake launched into space from Baikonur, Kazakhstan with Russian commander Yuri Malenchenko and NASA astronaut Tim Kopra on Dec. 15 at 11:03 GMT (6:03 pm EST) and will kick off the marathon at 10:00 GMT (5pm EST) on April 24.